Huffish success in Sweden, Norway, Italy and Denmark this weekend! Rachel and Camilla BOB yesterday! We got 2 new Championtitles: Huffish Heartbreak Hotel, “Torak” owner Anny Nilsson who came here 2 years ago for a pet puppie, she was not going to show at all. And she has done a remarkable job, travelling and grooming this Standard Poodle and he looks great, thank you Anny for all the work you put down with Torak, he is a handful. Toras is out of “Hollie” and “Thomas”. Swedish and Norwegian Champion, pictures please??? 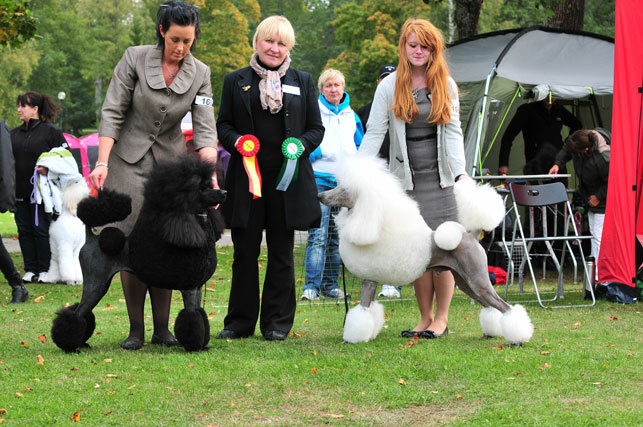 In Högbo our “Rachel” got BOB with Camilla and I think that means that she is currently topwinning Standard Poodle in Sweden right now. At the same show our Finnish boy, FinCH, Huffish On And On, “Dino” got his Swedish CAC and the Swedish Championtitle. Dino is probably also currently topwinning Standard Poodle in Finland, maybe he is second we are not sure. Congratulations also to Dinos owners and handlers. There will be pictures soon. Dino is out of “Kira” and “Diego”. In Denmark Sida went to show crazy girl Bonnie, she is a half sister to Torak and you can tell when you see them in the ring, Hollie baby with Diego as a father. She got the, CAC, CACIB and BOS to the white handsome “Thomas” son who also got his Danish Championtitle that day, Ch. Abicas Miles Ahead, bred and owned by Marianne and Kirsten and Kathy Arnold as a co-owner. I havent seen this dog for a while but he sure looks very nice, looking forward seeing him. Congratulations to all! Katarina also showed Chris in Italy, first time since he got back home to her again, he got BOB under breed specialist Mrs Lorena Merati and ended up 3rd in the group, Robert Blumel. This means that Hollie has 5 champions in the litter with Thomas, I hope I havent missed someone. It’s really great. Thomas got another champion as well and Diego got another championtitle on his kids. It’s really nice to see that both males and females can produce and its even nicer when I don’t need to be around and do all the job myself and the judges finds the dogs without me being in the ring. I can get use to stay home it was really really nice yesterday. Thanks to all that does a great job with the Huffish dogs, even if I don’t talk to you all the time, I think about you and I am very grateful! Hope you feel that? Off in the rain, its pooring down here! ← Everything at the same time!